One of the keys to living a long, healthy and happy life is slooooooowing down. Given that 95% of all disease is caused by stress, this is something we will all benefit from mastering. In this episode I share how they naturally do it in the Blue Zones of the world, and my top tips for slowing down to release stress. Welcome back to The Nick Broadhurst Show. I’m your host, Nick Broadhurst, also known as Broadhurst in the music world. And you can catch all of my work including my music, music videos, and every one of these podcast episodes at broad new world at www.iamnickbroadhurst.com. And you can check out my music on Spotify, Youtube, iTunes, Google, wherever you listen to music, just search for the word Broadhurst. And that song you were listening to is my latest single called Open Wide. It’s written about my wife. It is a really beautiful music video which is shot with strangers on the streets of Melbourne, putting their hands on each other’s hearts and staring into each other’s eyes candidly. It’s so stunning, it makes me really emotional every time I watch it. And you can catch that full song at iamnickbroadhurst.com/openwide or you can head to the show notes for today at iamnickbroadhurst.com/46, and I’ll put a link in there to the song and to the music video. So before we get started definitely listen to this longevity series in order. And you can start this series at iamnickbroadhurst.com/40, and this is going to give you an overview of what this longevity series is all about, and what the blue zones of the world are because I will refer to these blue zones pretty consistently throughout each episode. And 41 was Move Naturally, 42 was Eat Until 80%, 43 was Eat More Plants, 44 was Get your Antioxidants, 45 was Know your Purpose, and 46 which is today’s episode is called Slow Down. So today in the 6th of 9 pillars of longevity, we’re going to take a deep dive into slowing down. In other words, combating stress. So how do they do this in the blue zones of the world? Well basically it’s kind of built into their days, they don’t have to think about it. In Nicoya, Costa Rica, they take a rest every afternoon and catch up with friends. In Okinawa the ladies gather every evening before supper in their moai, and we’ll speak about what that is in more detail in a future pillar in this series. The Seventh Day Adventist of Loma Linda California use the Sabbath, which is sundown Friday to sundown Saturday, to create a sanctuary in time where they focus on family, god, and nature. No work, just play. How cool is that? And the beautiful thing about slowing down is that it ties together so many of the other pillars; eating right, appreciating friends, finding time for spirituality, making family a priority, creating things that bring purpose into your life. And I try to build this into my general operating system. I know we all want to achieve things in life but the challenge is can we do this with ease and grace? And I’ve got better and better at saying no to a lot of things. Not because I’m busy, but because I don’t want to become too busy. I take around 1 and a half to 2 hours a day around lunch time for a walk to enjoy my lunch, to get some sunshine. Is that a luxury? Maybe for some. But that’s the life that I wanted to create. For me it’s just what I do. I know this is not possible for everyone but we can all create our own reality. And so if there’s something that you want to do every day, well it’s not going to happen if you don’t create it. So taking those steps towards creating wide space, creating the day that you want, obviously that’s how it’s going to happen, it’s by trying to make it happen, is creating it. If you don’t like what you just created, create again. And I don’t feel myself If I don’t get my me time. My me time is so important for me. And I’ve paid the price for going way too hard for too long. And trust me, it is just not worth it. There is so much goals, so much juice and richness in slowing down. It is so beautiful. A centenarian of Nicoya was asked if he gets bored and what he does to entertain himself. To which he replied, “I find a patch of shade and eat an orange.” How cool is that? Seriously. I mean that’s my idea of heaven. Might sound crazy to some, but that sounds to me like heaven. In Ikaria if you invite someone over for lunch they might arrive at 10am or 4pm or 6pm because there’s no schedule, there’s no clock. And how beautiful is that? If only, right? If only. And they consider their villages as an ‘us’ place, not a ‘me’ place. So beautiful. But of course that’s not how the majority of us listening to broad new world can live. I mean we can move towards some of these things, but it’s not a reality for all of us. So what is the lesson here in this pillar? It’s really simple. Take time each day to slow down. And what is the most effective way to do this? I believe it’s meditation. Meditation is true freedom. And I practice a form of meditation called transcendental meditation or Vedic meditation. I do it twice a day, mostly. Some days I do miss it. But on most days I do it twice a day for 20 minutes, and it’s been scientifically proven that that’s equal to eight hours of sleep. Because this particular type of meditation is four times deeper than sleep. That is efficiency. That is getting bang for your buck. And I speak about meditation in episode number 8, which is called Meditation Made Easy, where I provide you with all sorts of options, and one in particular which we can all do to slow down, and it’s free. If we look at this pillar scientifically, I believe the centenarians of these blue zones simply spend more time in the parasympathetic nervous system state which is the rest and digest state. Not the sympathetic, which is the fight or flight state that most of us are faced with everyday. Every notification on your phone is a trigger for fight or flight. Just looking at your phone has been proven to cause a stress response. So here’s a hot tip for you, turn all the notifications on your phone off. No emails, no messages, no Facebook, no Instagram, turn them off. Do we really need to be notified about every email? Do we need to be notified when someone likes a post? No, we just don’t need to be so connected to our device. My phone is always in flight mode except when I need to make a phone call. Even right now doing this podcast on Instagram Live at the same time simultaneously my phone is on flight mode with the Wi-Fi turned on. You know, people have just learned, don’t call me. I use technology for my benefit. I’ve learnt how to make it work for me so it doesn’t become my boss. So I’m not a slave to the technology. And I will do an episode on this one day because it’s something which I’ve really refined over the years and still refining and I still slip up; of course, every day I slip up, but I do my best. Don’t we all? So here are my tips for slowing down. And number 1 would be to create space in your day for me time. And if you don’t have space right now, then try waking up 30 minutes earlier. It’s a beautiful beautiful time of day. Between 4 and 5 roughly is the time of the divine. It’s a spiritual time. It’s a perfect time to do yoga and to meditate, to do your sun salutations, to give gratitude. Number 2 my tip would be to meditate. Number 3 would be don’t rush. Get to appointments early, like 15 minutes early so you’re not creating unnecessary stress. I hate rushing to meetings. I hate pushing it to get to the airport just on time. Why not just get there an hour early and do a bit of work at the airport? Why stress? Really simple stuff. Number 4 would be ditch the TV, ditch the iPads and the computer games. Try mind games that you can do together. And in our family we have a really simple game that we love which is called the alphabet game. All you need to do is a have a piece of paper each, you draw 7 columns, and at the top of each column you write: boy, girl, food, car, place, color, plant. And then someone will go and say the alphabet in their head silently and another person will tell them to stop. And they will stop on a letter. And then you fill out each column. So if it was F you would write Finland, Francesca, Ford, etc. And you get 10 points if you write something down that no one else writes. You get 5 points if you write something down that someone else writes. And 0 of course if you don’t write anything down. You tally the points and you see who wins. It’s really fun. We do about 6 or 7 rounds sometimes at dinner. And it’s just a way to exercise our brains, but a way to socialize, a way to relax, a way to connect after a meal without having to turn on the TV. And another tip would be to walk every day. And I did an episode on this called, Want More Energy And Better Health? Do This. That’s at iamnickbroadhurst.com/38 and that’s on doing 10.000 steps a day. Walking is so powerful. It is so important on so many levels. And it ties together so many of the pillars of longevity which is why I love it so much. 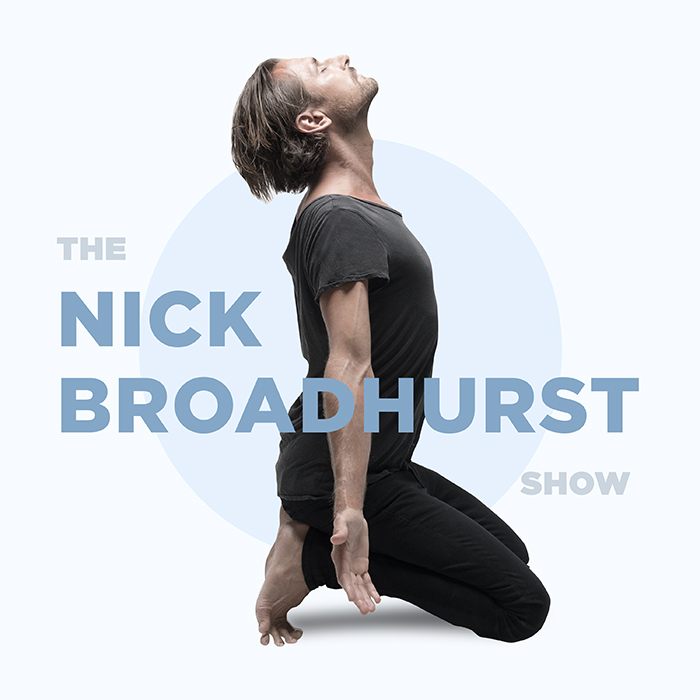 So that my friends is episode number 46 of The Nick Broadhurst Show. You can get all the show notes, everything I mentioned, at iamnickbroadhurst.com/46, where you can also get a full transcript of the show. And please make sure you hit the subscribe button in your podcast app so you don’t miss an episode. Leave me a 5 star review in iTunes letting me know what you love and what you want more of. And share this episode with a friend or on social media using my handle @IAmNickBroadhurst so I can say hello. And remember today to look up, see the beauty around you, see the beauty within you, be gentle with yourself. Be love, slow down, create some wide space, mediate, walk, don’t rush. Don’t miss the gold we find by being so busy with the daily grind, listen to your intuition. And as always, have a beautiful day. I love you heaps. Ciao.